The Wal-Hamdu-Lillah Cemetery hails itself as California’s first Islamic cemetery, a 20-acre mortuary and burial ground established in 1998. 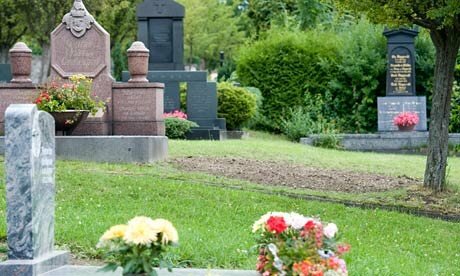 The cemetery adheres to Sharia burial rites, which include the ritual washing of the corpse, shrouding of the body, and burial without a casket, usually with little or no burial markers. In January it was confirmed that the more than 1000 people buried in Wal-Hamdu-Lillah include Syed Rizwan Farook and Tashfeen Malik, fundamentalist extremists who killed 14 people in a December 2015 attack in San Bernadino. The two were themselves killed hours after their attack, and it apparently took a week to find an Islamic cemetery that would accept their remains. Local observers soon suspected that the killers were interred in the cemetery in Rosamond, and the Mayor of neighboring Lancaster theatrically directed his City Attorney to prepare legislation that would outlaw the local burial of participants in terrorist acts. The anxiety sparked by the couple’s burial reflects their status among the most repugnant of the dead, people so evil that their physical remains threaten our common values after their death. Such figures’ literal corporeal remains hold a persistent grip on our collective anxiety, their memories firmly planted in heritage discourses even as we attempt to efface their human remains from the landscape. 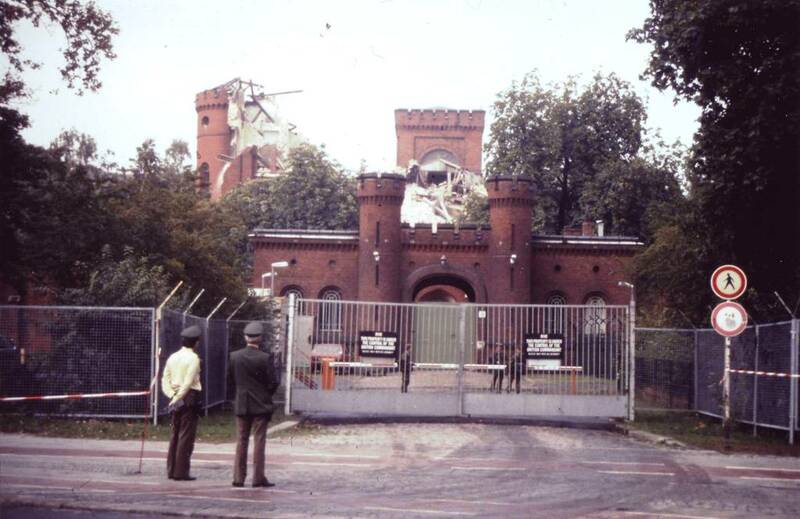 After Spandau Prison’s final prisoner Rudolf Hess died, the jail was torn down and its structural remains pulverized (image Bauamt Süd). There is genuine evidence that graves can become such rallying points for extremists. For instance, Rudolf Hess died in Spandau Prison in 1987 after receiving a life sentence in the Nuremberg trials. Spandau itself was demolished after Hess’ death so it could not become a neo-Nazi shrine (offers of up to 100 marks were made for bricks from the prison—and one appeared on the British Antiques Roadshow–but the debris was reportedly pulverized). Hess was accorded a burial in the southern German town of Wunsiedel, and his grave rapidly became a pilgrimage site for contemporary neo-Nazis, with over 9000 people visiting for a 2004 march. In 2011 Hess’ body was removed for cremation, and his ashes scattered at sea. A year later the graves of Hitler’s parents had their markers removed to end extremists’ vigils in the cemetery in Leonding, Austria. Evil figures have often been denied identifiable resting places to defuse contemporary extremists who might be galvanized by pilgrimage to such a resting place. Journeys of spiritual consequence extend beyond formal faith to civil religions, heritage tourism, and even popular cultural fandoms (e.g., compare visitation to Jim Morrison’s grave in Paris). The remains of revered figures often become one of the key places followers visit on journeys that fortify deeply held values and provide spiritual inspiration. The distinction between pilgrimage and tourism is certainly fluid, but it perhaps revolves around the degree to which the emotional experience of pilgrimage and visitation shapes the visitor’s subsequent social and political activity; that is, a sacred journey binds us to a collective that shares and acts upon deeply held values. In the wake of World War II the Allies were wary that places like grave sites could sustain or ignite future political extremism, so the most prominent Nazi war criminals’ remains were not accorded formal burial places. When Berlin fell in 1945, the Soviets collected the remains of Hitler, Eva Braun, Joseph Goebbels, and Goebbels’ six children and wife; by most accounts their collective remains were eventually cremated in about 1970 and scattered in the Biederitz River, though fragments of Hitler’s skull are rumored to remain in Russian hands. The 10 Nazis executed October 16, 1946 following the Nuremberg trials (and Herman Goring, who killed himself the night before) were cremated and their ashes scattered in a river. 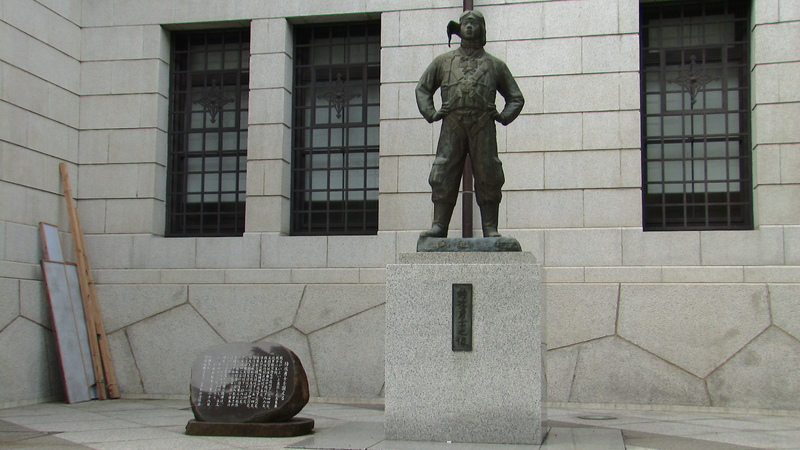 A memorial to Kamizake pilots at the Yasukuni Shrine in Tokyo (image Takashi Ueki). However, other war criminals’ remains have been placed at rest in politically charged places. Japanese Prime Minister and Imperial Army General Hideki Tōjō directed the attack on Pearl Harbor, and at war’s end he was taken prisoner by American forces after an unsuccessful suicide attempt. A military tribunal found Tōjō guilty of war crimes and sentenced him to death in 1948. Tōjō and six others were executed on the same day, and a portion of their cremated remains were spirited away by sympathetic Japanese observers who eventually buried the ashes in 1960 at a “grave of the seven martyrs” on Mt. Sangane in Aichi Prefecture. Tōjō is also memorialized at Tokyo’s Yasukuni Shrine, one of 14 Class A war criminals (that is, a “crime against peace”) whose souls are honored in the Shinto shrine. State visits to the shrine have continually been the source of tension to those who see the shrine as a symbol of Japanese wartime aggression, the nation’s post-war disinterest in critical heritage, and an unapologetic right-wing Japanese victimhood narrative. Wholesale removal of Nazi landscapes is practically impossible, but there have been consistent efforts to efface the mortal remains of war criminals and ideological martyrs. Nazi graves that had revered symbolic status during the war were instantly destroyed or had their party symbols removed at war’s end. For instance, in December, 1926 Horst Wessel joined the National Socialist German Workers’ Party and the paramilitary Sturmabteilung (also known as the SA or the “brownshirts”). During the formative years of the party, Wessel worked closely with the Berlin regional party leader, Joseph Goebbels. In January, 1930 Wessel was murdered by a Communist party member, and after his death Wessel’s Berlin gravesite became the scene of Nazi propaganda events. After the war, Wessel’s grave was defaced to remove its party references, and his body may also have been removed (the final remnants of the memorial, which also marked his father’s grave, were finally removed in 2013). Nevertheless, visitors to the former burial site continue to leave flowers, its effacement insufficient to erase the symbolism of the place. Reinhard Heydrich’s burial memorial was removed after the war. Likewise, Berlin’s Invalid Cemetery (Invalidenfriedhof) lay in East Berlin along the Berlin Wall, and over a third of the post-1748 military cemetery was destroyed in the immediate wake of the war for guard tower and road access construction. Among the wartime burials in the cemetery was SS-Obergruppenführer Reinhard Heydrich, who chaired the 1942 Wannsee Conference that articulated the concrete plans for the “Final Solution” for Jewish genocide. Reich-Protector of Bohemia and Moravia (now the Czech Republic), Heydrich was attacked in Prague in May, 1942 and died a week later. Heydrich was accorded a lavish funeral in Prague and then buried in a second ceremony in Berlin, where Himmler delivered the eulogy at a funeral at which Hitler presented Heydrich with the German Order, the highest award of the Third Reich. 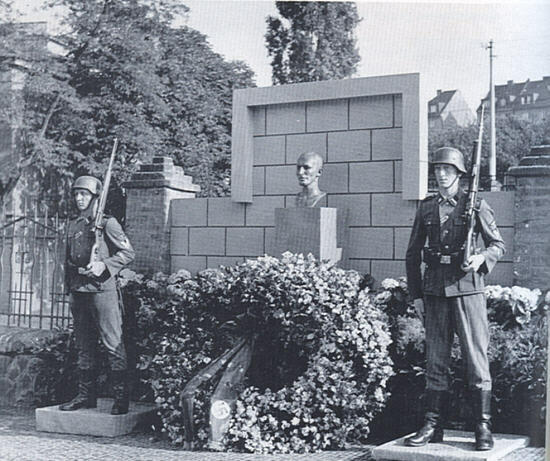 Heydrich was buried in the Invalids Cemetery, but the war ended before an impressive memorial by Nazi sculptor Arno Breker and architect Wilhelm Kreis could be constructed. The exact location of Heydrich’s grave is not clearly documented, and there is suggestive evidence that Heydrich’s remains were removed at war’s end by his widow. Yet as at Wessel’s grave, neo-Nazis continue to herald Heydrich’s ideological zealotry for the Nazi cause and leave flowers and offerings at the grave site. The abhorrent dead are defined by their death in service to an evil cause that we worry will live on or be revived after their deaths. That may distinguish the likes of Timothy McVeigh, Reinhard Heydrich, and the San Bernadino murderers from Jeffrey Dahmer, whose reprehensible acts were driven by mental illness rather than ideology (Dahmer’s cremated remains were divided between his parents). All of these figures capture our attention because they did unimaginable things, and effacing their bodies attempts to deny them the dignity and mourning we theoretically accord to even our most humble peer. Dark tourism acknowledges our fascination with the concrete sites of perpetration, like Wannsee, the Nuremberg rally grounds, or concentration camps. However, it somewhat uneasily views the literal bodies of perpetrators because acknowledging their humanity hazards failing to distinguish between perpetrators and victims. The corporeal remains of such figures risks separating them from their victims, providing a place for mourning an evil person in ways that humanize them outside the unimaginable acts that now define them. Effacing these graves or denying evil people identifiable burials does not efface them from heritage or even from material space, but it aspires to place them beyond the pale of place and separate their bodies and acts from our own. 2003 Pilgrimage Through a Burning World: Spiritual Practice and Nonviolent Protest at the Nevada Test Site. SUNY Press, Albany. 2011 Pilgrimage in a Secular Age: Religious & Consumer Landscapes of Late–Modernity. PhD dissertation, University of Exeter. 2000 Dark Tourism: The Attraction of Death and Disaster. Thomson, London. 2008 The Pilgrimage to Jim Morison’s Grave at Pere Lachaise Cemetery: The Social Construction of Sacred Space. In Shrines and Pilgrimage in the Modern World: New Itineraries Into the Sacred, edited by Peter Jan Margry, pp.143-171. Amsterdam University Press, Amsterdam. 2009 Difficult Heritage: Negotiating the Nazi Past in Nuremberg and Beyond. Routledge, New York. 2010 The Yasukuni Shrine Conundrum: Japan’s Contested Identity and Memory. In Northeast Asia’s Difficult Past: Essays in Collective Memory, edited by Mikyoung Kim and Barry Schwartz, pp.31-52. Palgrave Macmillan, New York. 2011 Beyond the Mushroom Cloud: Commemoration, Religion, and Responsibility after Hiroshima. Fordham University Press, New York. 2013 The Making of a Nazi Hero: The Murder and Myth of Horst Wessel. I.B.Tauris, London. 2006 A dark tourism spectrum: Towards a typology of death and macabre related tourist sites, attractions and exhibitions. Tourism 54(2):145-160. Posted on May 5, 2016, in Uncategorized and tagged #WPLongform, dark tourism, World War II, Yasukuni. Bookmark the permalink. 1 Comment. Interesting read! In fact one sometimes wonder about what happens of the bodies of these sort of people (think the Paris attackers, or the 9/11 ones…). If I may add one bit, Mussolini’s grave in Predappio is not secret at all and in fact has become a sort of pilgrimage site for buffoons of all sorts.